So you’ve always wanted to get your pilot license, but your severe fear of flying has held you back. Not to mention you’re more interested in flight simulation games than actual aircraft flying. But all of that dreaming has done nothing to thwart your love of aircraft themed gadgets. And this one is an awesome example. 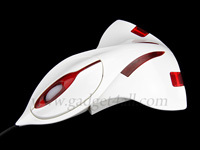 This USB Aircraft Mouse is an awesome addition to a plane lovers desk. The aircraft design also makes the mouse an ergonomic joy, though a little too chunky for some people. It’s probably not the kind of mouse you want to pack in a laptop case. Weighing 90 grams, the Aircraft Mouse is considerably lighter than it looks. The mouse itsel offers 800 dpi resolution, plug and play support, and an LED indicator which glows when the mouse is connected into your USB port. While it offers support for Windows 98SE/2000/ME/XP/Vista, there’s no word on whether or not this mouse works for Mac. The USB Aircraft Mouse can be yours for $17.00. Not a bad price for a really cool designed mouse. You’ll be hard pressed to find a mouse this cheap and looks this cool, even from retailers such as Wal-Mart. 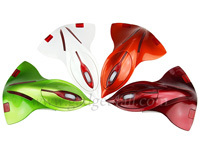 The USB Aircraft Mouse comes in your choice of red, orange, green, white, or black.